Old Dog Syndrome - What Is It? ‘Old Dog Syndrome’ is the canine equivalent of Alzheimer’s Disease in humans. There are lots of other ways that this condition can be (and has been) described including ‘senility‘, ‘dementia‘ and plain ‘old age‘. The scientific name for it is ‘Canine Dysfunction Syndrome’ (aka CDS). There are a wide range of possible symptoms including anxiety, incontinence, confusion, excessive barking/pacing and more. If your dog is showing one (or several) of these signs you might be wondering if it’s just ‘old age’ that’s causing his problems, or if there’s an underlying health worry. Dizzy? Head Tilt? Rapid Eye Movements? Click on this link… Old Dog Vestibular Syndrome….. to learn more about the ‘other’ old dog syndrome. There’s a lot more to Canine Dysfunction Syndrome than the normal slowing down that accompanies the aging process. Studies showing that around 50% of dogs who are eight years or older show some signs of this condition. By age eleven it’s over 60%. 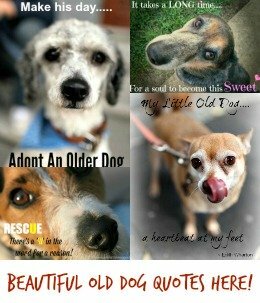 The information on this page will help you figure out whether or not your senior is showing signs of old dog syndrome. You’ll also find all the tips and advice you need to choose the right treatment options and the best coping and management techniques. Use can use these links to jump to….. There are a LOT of different symptoms that might mean Fido has Canine Dysfunction Syndrome… but many of them can also be signs of other health problems too. Symptoms can be divided into two categories, physical and emotional/psychological. Usually you diagnose a health problem by looking at the symptoms, and this is true with old dog syndrome too… but it’s not as easy as diagnosing a broken leg or an upset tummy. The signs of Canine Cognitive Dysfunction Syndrome can be very subtle, and they can also point to more than one condition. Every dog is unique and might show a different set of symptoms, or experience them to a greater, or lesser, degree. So it’s easy to see the problems facing owners and veterinarians. There isn’t one definitive blood-test or diagnostic procedure that can diagnose Canine Dysfunction Syndrome. Researchers have found subtle changes in the brains of dogs with Old Dog Syndrome, similar to the changes that happen in the brains of human Alzheimer’s patients. But brain scans or other procedures aren’t considered to be useful at this point and so aren’t available for CDS testing. Your veterinarian makes a diagnosis of Canine Dysfunction Syndrome in two ways…. So, if your senior dog is showing one, or more, of the symptoms listed on this page then your first step is to get him a full health check-up to rule out underlying diseases. There are a couple of mainstream veterinary treatments for old dog syndrome, including the drug Anipryl which is proving to be very successful. Then there are also alternative treatments, dietary changes and behavior modification techniques. Sometimes a combination of several different options gives the best results. Antioxidants such as Vitamins E & C, and L-Carnitine can help protect Fido’s brain cells from further damage. Omega-3 fatty acids reduce inflammation, improve circulation and lower blood pressure, all of which helps to keep those brain cells healthy. This means that Fido should find it easier to learn new things, or remember new or old habits and lessons. Neutricks Soft Chews contain Apoaequorin which has been tested in trials and shown to improve memory, cognition and performance in dogs with cognitive dysfunction. In fact, two separate trials demonstrated that Apoaequorin may be more beneficial than Anipryl which is currently the only FDA approved medication available to veterinarians to treat old dog syndrome. Some herbs might also be helpful, such as Lemon Balm and Gingko. Look for a dog food that’s rich in antioxidants. Fruit and vegetables are good for reducing inflammation, and adding organic, cold-pressed Coconut Oil to his food daily is beneficial for many functions, including the brain. There is no specific dosage recommendations for adding coconut to your dog’s diet, but most veterinarians recommend that you start with what’s considered to be a low dose and work up from there. This could mean starting at 1/4 tsp of coconut oil per 10lbs of body weight and gradually increasing that up to a maximum of 1 tsp per 10lbs. Loose stools can be a result of giving too much coconut oil before your dog’s digestive system has adjusted to it, if this happens cut back until the stools firm up and then slowly increase as needed. 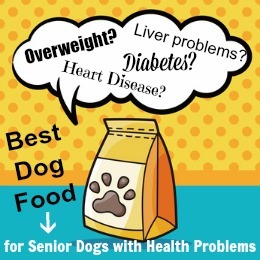 There are a range of different nutritional supplements which claim to help dogs with age-related cognitive decline. Generally they contain ingredients which can help promote healthy neurological function and protect neurotransmitters (as well as having positive effects on other parts of the body). Supplements containing Choline are often recommended by veterinarians to treat Old Dog Syndrome, and also as an apparently fairly effective preventative measure. Choline is an essential nutrient that has benefits for not just the brain, but also helps maintain healthy liver function, lung function, metabolism and more. It’s also often suggested for dogs seizures, diabetes and adrenal disease. There are very few side effects of giving Chloine (often found as Phosphatidylcholine in supplements) to dogs. Sometimes a dog can become extra excitable or nervous/hyper/anxious. If this happens, reducing the dose might help. If it doesn’t then Choline is probably not suitable for him/her. Recommended veterinary dosage of Choline for dogs with CDS is between 0.5 and 1.0 mg per lb of bodyweight. Phosphatidylserine has been shown to help improve memory function and understanding, and is found in products such as Senilife and Thorne Canine Geriatric Basics. Adenosyl maintains good overall brain health and can also improve the quality of sleep and support memory function. It can be found in the Nutramax Denosyl chewables and the S-adenosyl (SAMe) tablets. Learn more, or purchase, these supplements and more by clicking on the product links below. Supplements may not help all dogs, but as they don’t pose any health risks when used properly in my opinion it’s worth checking some out. Either way, make sure you’re choosing premium quality food/supplements and avoid artificial additives and chemicals. Dogs with CDS sometimes lose interest in food, or ‘forget’ to eat, so you’ll need to make sure that Fido actually eats his anti-oxidant rich food. Supplements can be given in tasty treats – most dogs of any age rarely turn down a yummy! If sleep is a problem for your older dog (ie he doesn’t sleep enough, wakes up too often or is restless at night) products containing melatonin can help. Natural products that have a calming or sedative effect (such as Flower Remedies or even phermone diffusers) might be helpful too. In humans, research shows that elderly people who are socially isolated and whose brains are under-stimulated (basically they’re ‘vegetating’) are up to 68% more likely to develop Alzheimer’s, or dementia. It seems that the same might be true of dogs. Several studies and ongoing research shows that when Fido’s brain (and body) are exercised, his learning (or cognitive) ability improves. This might be due to the increased blood flow through major organs, including the brain, that comes with exercise. Older dogs sometimes want to sleep all the time, especially those with old dog syndrome, but they need some daily exercise. And don’t discount the social benefits of getting out-and-about. Spending some time with his doggie friends might be just what the doctor ordered. Depending on your older dog’s general health ‘exercise’ might not be more than a slow amble around the block – but anything is better than nothing! Five minutes three times a day shouldn’t be too much for the majority of older dogs and it’s a good rule of thumb to aim for. You can exercise your dog’s brain by getting him some new toys, interactive ones are great. He might need ‘help’ with them at first, or perhaps always, but just spending time with you and the effort he spends playing can put a little spring back in his step. With puppies it’s always a good idea to rotate toys, so that they don’t get bored with the same ones every day. This works well for older dogs with CDS as well. Fido needs his normal routine as it helps to ground him, especially when he’s probably scared and confused by his confusion, but a little ‘supported’ change is a good thing. Unfortunately there isn’t a whole list of medications that can be given to dogs with Canine Cognitive Dysfunction Syndrome.In fact, there’s just one. The only FDA-approved drug for treating CDS is called Anipryl. It contains Deprenyl which has been used successfully to treat Parkinson’s Disease in humans. The good news is that Anipryl is proving to be very successful in reducing the symptoms, and slowing the progression, of old dog syndrome in many dogs. Of course it doesn’t work for everyone, and can interact negatively with some other drugs including some antidepressants and Amitraz (used to kill external parasites). There are also some side effects possible, including vomiting, diarrhea, lethargy and dizziness. Your veterinarian will monitor Fido carefully if he prescribes Anipryl and adjust how much he gets each day until he finds the minimum effective dosage. Selegiline is a drug which is FDA approved for the treatment of Cushing’s Disease in dogs, but which has also shown to be helpful in the treatment of ‘Old Dog Syndrome’. Sometimes sedatives are also prescribed to help reduce the anxiety and night-time restlessness that plague older dogs with CDS. Once you’ve ruled out any other health issues as the cause of your dog’s symptoms, and started him on whatever treatment/s you and your veterinarian think best, ‘management’ becomes the name of the game. Well, basically you want to help Fido to ‘manage’ his symptoms better, and help yourself to cope with the results of them. Senior dogs who’re suffering from old dog syndrome get easily confused, disoriented and forgetful… even in environments that are totally familiar. This must be terrifying for them. So, imagine how much worse it is for Fido when all the furniture in a room gets switched around, someone new comes into the family (or someone familiar leaves), you do major landscaping on the back yard or his family moves to a new home. It just compounds the problem. Obviously you can’t build your whole life around your dog’s needs, and sometimes changes are out of your control, but for Fido’s sake it’s best to keep change to a minimum whenever you can. He probably has a predictable daily routine as well, one that he measures his day by (even if he spends 20 out of 24 hours asleep! ), so try not to mess with that if you can help it either. Some of the symptoms of Canine Dysfunction Syndrome can be very disruptive and even destructive. Others are simply irritating or inconvenient. All of them are signs that your senior dog is scared, anxious and confused – so patience and understanding is needed. Sometimes in bucket-loads. House-soiling is one of the biggest issues that you might be facing, and it’s easy to get frustrated and impatient when you’re forever washing bedding and cleaning carpets. BUT, remember, your old dog can’t help her ‘accidents’ they’re totally involuntary, and she may have no idea she’s peeing (or has peed) – and not even realize anymore that that she shouldn’t do it indoors. Luckily there are things you can do to minimize the mess, and my page on incontinence in older dogs can help you with those. You can also find a wide selection of the very best products to help keep your dog dry and comfy, and protect your home and car here… Best Dog Incontinence Products. Separation anxiety can sometimes rear it’s head out of the blue when an older dog starts showing symptoms of CDS. Extreme anxiety and fearful behavior isn’t unusual, and if Fido is feeling scared and confused, it’s not surprising that he wants to stick close to the person he loves the most. Suddenly having a ‘velcro dog’ attached to your leg can be a bit of a challenge at first! But with love, patience, kindness and understanding you should be able to help him feel less scared and more secure. A crate with a comfy (and washable) crate pad can make a great, and safe, hideaway for your nervous dog. If he’s used to being crated from time to time it’s a good idea to do this for short periods every day. Start with you staying in the same room, or at least within his earshot, then gradually work your way up to being able to leave him for slightly longer periods, with you out of sight and hearing. BUT, if this upsets Fido so much that he becomes hysterical then you may have to discard the plan, for now. Even adult dogs who aren’t used to being crated often take to it without too much trouble. If you’ve adopted an older dog, or haven’t crated your dog before, this will be something you’ll find out through trial and error. Natural remedies that have a relaxing or calming effect can help reduce this sort of anxiety, and may be worth a try if your dog gets upset. Dogs with Canine Dysfunction Syndrome sometimes seem to go through a bit of a ‘Jekyll and Hyde’ transformation. Your once happy dog might become fearful, anxious or just sad. The dog who loved everyone might react defensively, or even aggressively, towards other people or pets. The laid-back soul who took life in his stride could become jumpy, irritable or sly. This is obviously upsetting for everyone, especially for those who has loved this dog for many years. Suddenly you’re not sure who he is anymore! But Fido is STILL your little boy and the only thing you can really do is accept that his feelings and reactions are involuntary – he can’t control them – and help him to feel secure and safe… and above all, loved. Often with a combination of supplements, dietary changes, exercise and medication many of these ‘over-reactions’ will settle down and you’ll see that old familiar dog again. Or most of him at least. Keeping a predictable routine and minimizing change helps here too. Old Dog Syndrome can be mild enough that the symptoms are minimal, or severe enough to cause real disruption to your life, and your dog’s life. Diagnosis is crucial, and there are lots of things you can do to help Fido feel better and ease the problems that come along with this condition. Because all dogs are different, what works for one won’t necessarily work for another, so a fair amount of trial-and-error is to be expected. YOU know your own dog best, so although you need expert and professional opinions and help, trust your instincts when it comes to the changes you’re seeing and how you interpret them. 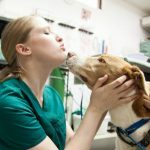 If you work closely with your veterinarian and use all the remedies, techniques and suggestions above you stand the best chance of reducing your dogs CDS symptoms to manageable levels and improving his quality of life significantly. Medications, diet and behavioral changes aren’t the only things you’ll need to help Fido feel better! You’ll need a lot of patience, understanding and empathy and as much love as you can possibly find… but thankfully that shouldn’t be too hard, after all our old dogs are irresistibly lovable and they deserve every bit of help we can give them. Although the passing of the years is something we can’t stop, it is possible to take steps towards protecting your dog from developing Old Dog Syndrome. Making sure that your dog stays active – both physically and mentally – as he ages can help slow down, or even prevent, the onset of Canine Dysfunction Syndrome. A healthy diet and lifestyle, with regular veterinary care also has a huge impact on Fido’s overall health, and even how long he lives! My Bichon is 16 and has two attacks of PulmonRy Congestive Heart Failure and is on several meds, it is a daily challenge to get them in her, she sleeps a lot as well. She has just started whimpering and pacing, I think due to anxiety caused by loss of sight and hearing. I will try to find a holistic approach to Her anxiety. When my first dog was very anxious about losing his sight I went to my own homeopath and told him about my dog. He asked me to describe him and I told him a lot about him. He wanted to finding out his “character” . He gave me a remedy which I put directly in his mouth with a syringe. Within a half hour he stopped walking in circles and laid on my lap. So, if you can’t find a holistic Vet, try your own homeopath. Also, for my young dog who had anxiety about everything, I put a couple of drops of Bach Remedies “Aspen” in her water dish. It took longer but it greatly reduced her anxiety. homeopathic medication has been proven time and time again to be nothing but water, it’s one thing for a person to choose to use that crap but neglecting treatment for your pet because your BS beliefs is evil. Syringe feed her. I’m doing that with mine and by blending the meds and supplements with the food I know he’s getting enough nutrution and meds. My Springer spaniel has just this week turned 18. He is still playing, walking for up to a hour, eating, drinking etc. But I feel that this week he has started pacing and panting more. I think that when he stops eating then that will be the time to say goodbye.